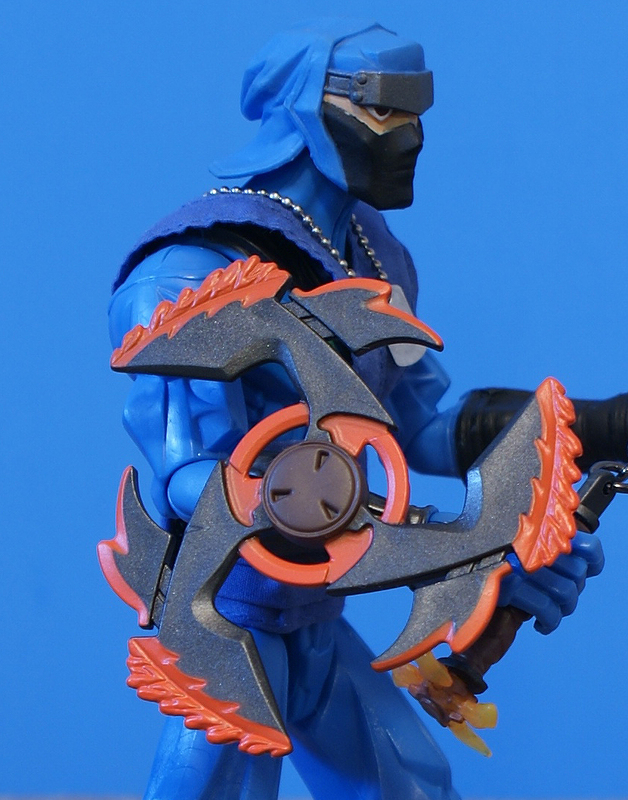 Who’d have thought that Kamakura, Snake Eyes’ green garbed apprentice would show up wearing electric blue? But that’s what you get with Sigma 6; it zigs just when you think it will zag. 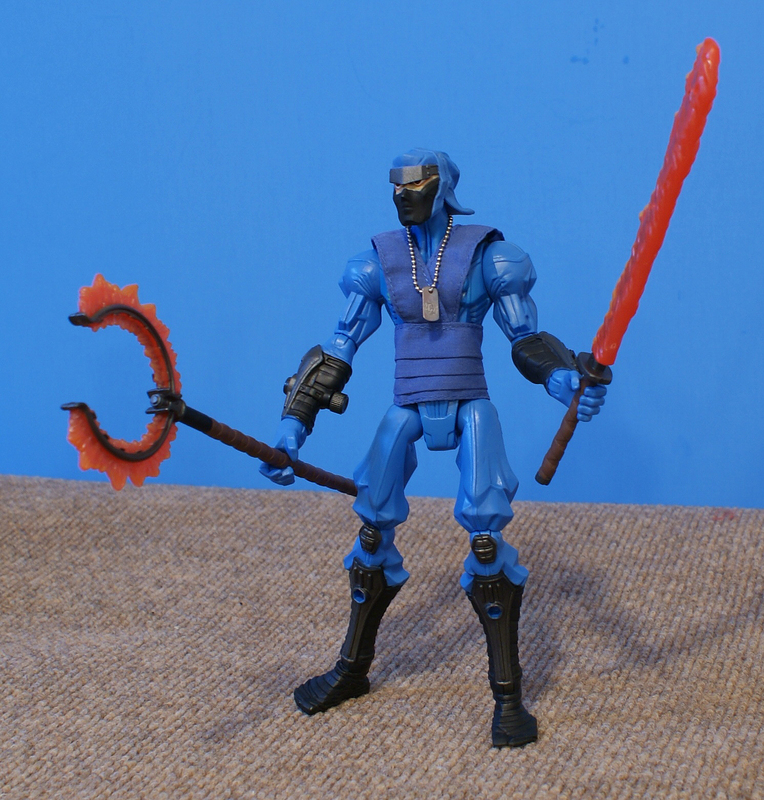 Since his introduction to the GI Joe mythos, Kamakura has been the victim of both odd color choices and weird gimmicks. Remember the lemon-headed, sword-drawing figure? If not, here it is. Thankfully, this Sigma 6 version improves on both counts. I like the bold blue, with limited contrasting paint apps. 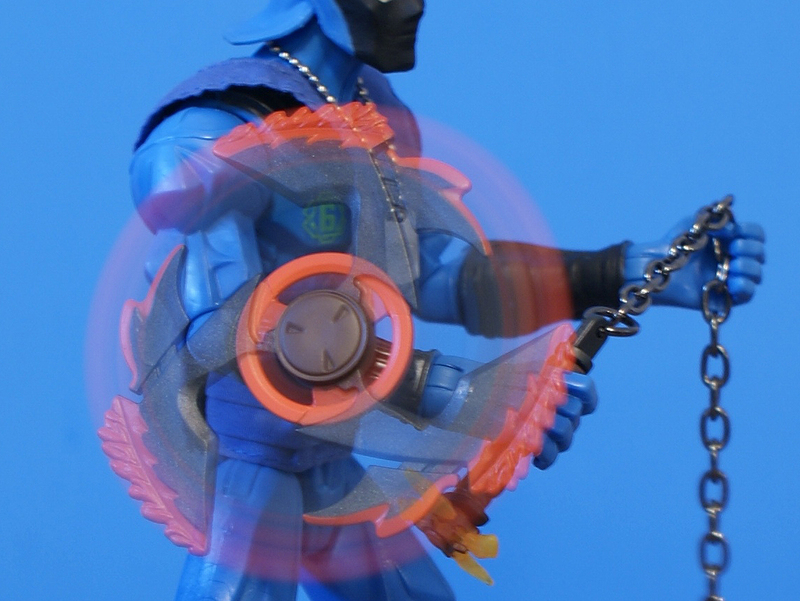 As far as action features, on the inside of his right forearm is a knob that will spin anything plugged into his forearm Sigma port. The included “flamecutter” blade works best, and the feature is unique without being too intrusive. Also nicely fitted is his cloth vest, which is amazingly tailored to his form and looks quite convincing. The 8 inch scale really allows for a nice integration of soft goods. 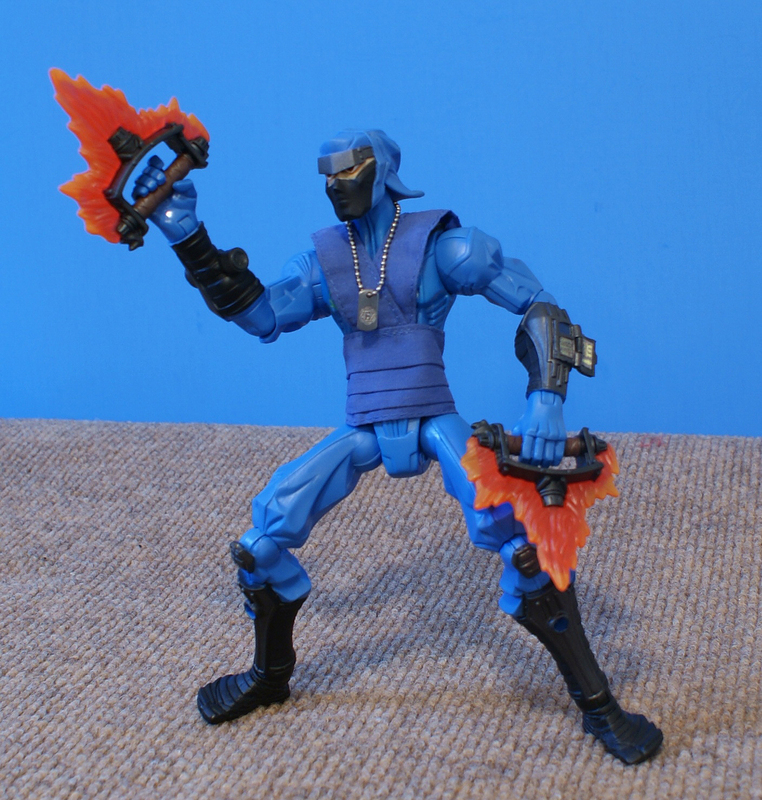 All of his weapons are of course fire-related, developed by High-Tech to complement a martial arts flame technique imparted to him by his master, Snake Eyes. 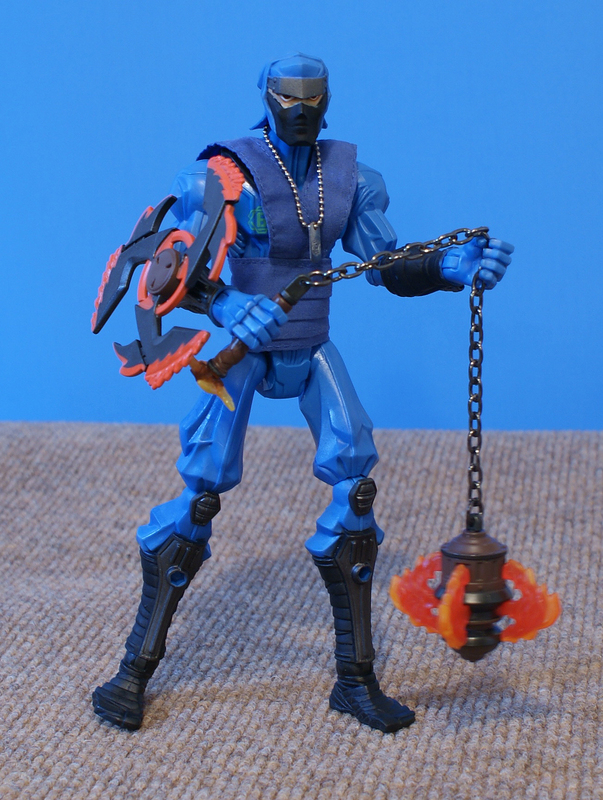 Along with the aforementioned cutter, he also carries a fire snare, mace, dagger, shuriken and most impressively, a sword. The blade has a removable flame sheath that reveals a normal sword inside. Very cool. I watched krull again recently. It takes him the whole damn movie to finally throw that thing! I can’t believe I thought it was awesome as a kid. I didn’t see ‘Krull’ until 2006. My only exposure to it as a kid was that there was a commercial for it on the vhs copy of Transformers: the movie which I used to rent from the video store. This is one of those Sigma 6 figures that really shows off the capabilities of the line well. I’ve gotta imagine some kids (or adults?) had fun with this figure. Aesthetically, I’m just not liking the blockiness of these figures. They kind of grow on you.